A group of 24 volunteers from four congregations volunteered at the Alameda County Community Food Bank (ACCFB) on Friday morning, December 30. This volunteer effort was sponsored by the Faith Trio, an alliance of Kehilla Community Synagogue along with Montclair Presbyterian Church and the Islamic Cultural Center of Northern California. Volunteers from Temple Sinai participated as well. The Faith Trio congregations have joined together to volunteer at the food bank at the end of December for the last four years, since 2013. 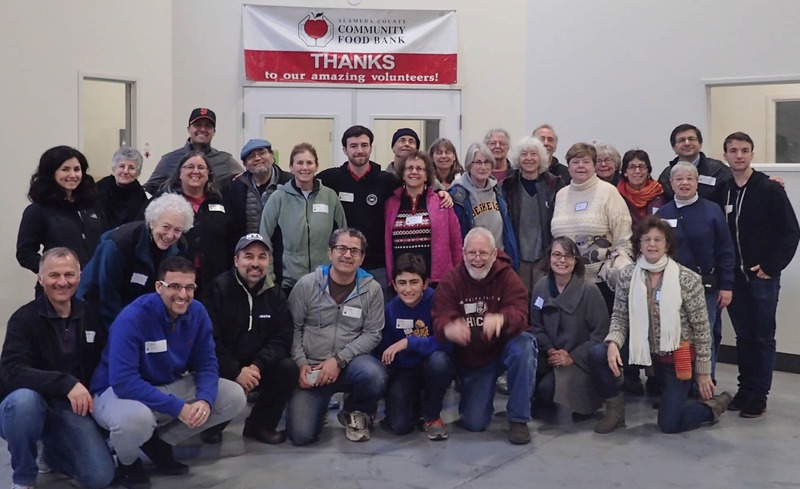 Volunteers from Kehilla were David Green, Jennie Schacht, Karen Friedman, Laird Harrison with his college age sons Trevor and Dashiell, Lea Delson, and Shari and Jonathan Cole and their son Oren, the youngest volunteer. Much appreciation to all the volunteers!